After far too long of a hiatus, I am ecstatic to be writing food truck Fridays again. 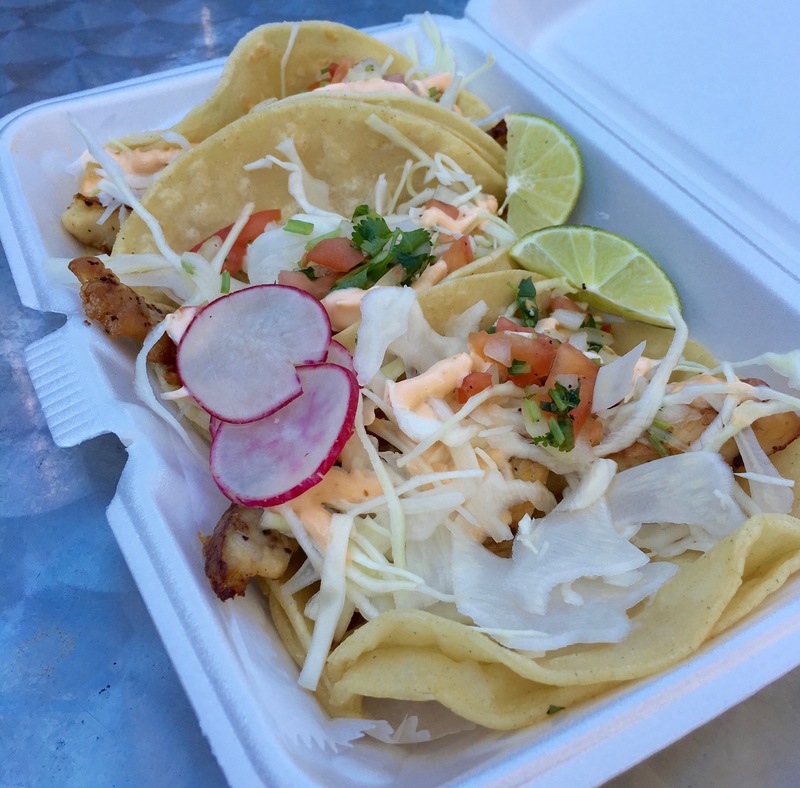 For the inaugural column of the year I decided to go to a food truck that is a perfect example of the wholesome elegance of a quality food truck. Dos Hermanos Tacos does not try to be overly impressive, rather they employ just the right level of gourmet and creativity to create a truly beautiful meal. Although there was nothing particularly unique about these fish tacos, they were so well executed that they were some the best fish tacos I have ever had. From the outside-in, every ingredient of these tacos is excellent on its own right. A perfectly fried fish fillet forms the core of this taco. It is warm throughout, but not too hot anywhere, and lightly crunchy. To add to the crunchy flavor, the fish is topped with fresh sliced cabbage. The cabbage also serves to introduce a fresher taste to cut fried fattiness of the fish. Pico de gallo furthers the freshness and brings the taco to the perfect balance of rich fried flavor and vegetal acidity. This whole taco is drizzled with a subtle yet powerful chipotle mayo. You barely notice the mayo or the sauce, but the flavor is vibrant and clearly chipotle. Although I would have preferred the sauce to be spicier, I am still happy with it as is. When I first saw this taco, I was skeptical about one major ingredient, the tortillas. There are two of them, which usually just results in a mouth full of tortillas that mask all the other flavors. Fortunately, this was not the case for Dos Hermanos Tacos. The added tortilla actually provides just enough additional structure to hold the large taco together well. I opted for corn tortillas. Dos Hermanos’ corn tortillas are a little more fatty tasting than your usual tortilla, which I think makes them all the better. Overall this taco was everything I wanted from a fish taco, with no extra bells and whistles to mess it up. At the surface, this taco seems incredibly simple. It’s just tinga-style chicken, onions, cilantro and a hot sauce. However simple the taco appears, its flavor is incredibly complex thanks to the chicken. 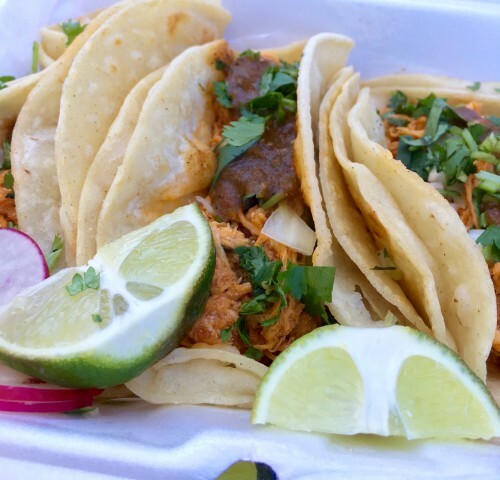 Chicken tinga is a common Mexican dish consisting of chicken that is boiled in seasoned water and then shredded and further cooked in a mixture of tomatoes, tomatillos, peppers and various seasonings. This chicken tastes like no other chicken I have ever had. It is incredibly juicy, and tastes like a tomato salsa with hints of chipotle. To top it all off, because it is shredded, it has a similar texture to that of pulled pork. Although the meat is the star of this taco, it has several supporting ingredients that deserve their 15 minutes of fame. The hot sauce adds a classic habanero-flavored heat to the taco. This heat is balanced out by the cooling flavor of onions and cilantro. Finally, the juices of the meat are absorbed by the same two tortillas used in the fish taco, which just serves to further season the already delicious tortillas. Yet again, Dos Hermanos Tacos has created a delicious meal by keeping it simple and elegant. Dos Hermanos Tacos is a great example of a perfectly executed food truck. They create delicious food by just perfecting each individual component. Give Dos Hermanos a try and I promise you will enjoy it, I know I did.